The Nigerian Optometric Association (NOA) has conferred on Edo State Governor, Mr Godwin Obaseki, its Ambassadorial Eye Care Award. The governor is the second recipient of the award in the country, which is the highest award of the professional body. The first recipient of the Award is a former Minister of Women Affairs and Social development, Senator Aisha Jummai Alhassan. On why the governor was the recipient of the award, the President of NOA Dr Damian Echendu said the award was in recognition of the governor’s contributions to quality health care delivery in the country. 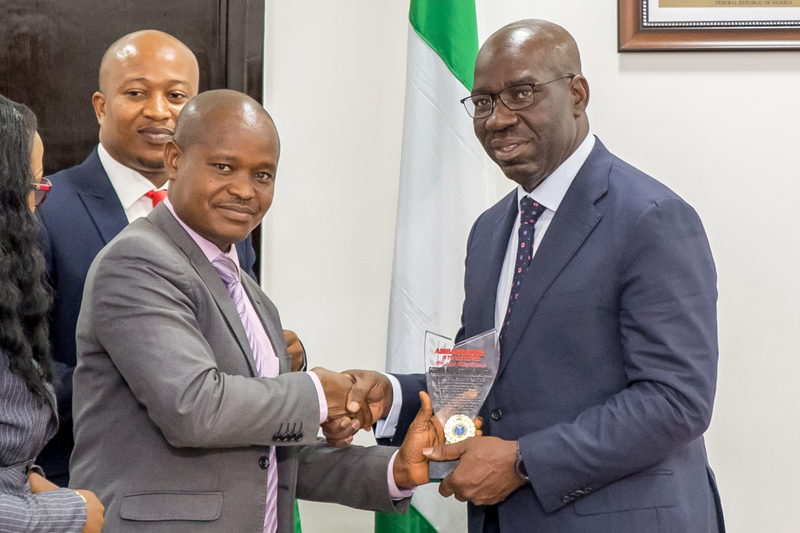 Governor Obaseki, receiving the award at Edo State Government House in Benin on Monday, commended the association for finding him worthy as a recipient saying ‘’it is a call to duty’’. He said the award would propel his administration to set up an action plan for quality ophthalmological service delivery in the state. For his part, Echendu, represented by the Vice President of the association, Dr Noris Ovili, intimated Governor Obaseki of its National Conference/Annual General Meeting to be hosted by the Edo chapter in the state in July. Responding, the governor promised to attend the forthcoming national conference of the association, which will take place in the state, urging the association to combat the challenges confronting the eye care sector. Speaking further, he added that he would unveil his policies for the health sector during the conference. Echendu, soliciting the support of the governor to host the programme, requested his presence as a special guest at the event and asked that the governor should deliver the keynote address. In addition, the Edo Chairman of the association, Dr Michael Nwoko said the association was committed to ensuring visual wellbeing of the populace. Nwoko gave the theme of the proposed Conference as ‘’Better Eye Health – The Responsibility of All”.